Tribute to a 'ghetto genius' ! When you grow up in the inner city you come in contact with an assorted cast of characters. Characters quite unlike those found in a Mark Twain novel. In my neighborhood, the characters had a greater resemblance to those described by the great Charles Dickens; rogues and criminal geniuses. In my neighborhood, con-artist were many while creative artist were few. Unfortunately, some men combined the best of both worlds to become creative con-artist whose treachery was legendary. It is easy to learn bad things from bad people, the ill-gotten gains of their treachery are easily on display in bad neighborhoods. Even good kids will dabble in the "devils work" because it's the most readily acceptable currency and commodity. The villain and the outlaw have a greater power of seduction when you live "on the other side of town". George Cain was a good kid once, a neighborhood legend. He was a high school basketball star and he went to a well known private school. He was hyper-intelligent and he received a college scholarship that should have been his passport out of my neighborhood. Unfortunately for George, he could never turn his back on our neighborhood, never give up his membership in the underclass. He would be tied by a string of remembrance to my neighborhood forever. He would hold fast to the rope of heroin addiction until it took its toll on him. What made George stand out, was not his addiction to heroin in a neighborhood filled with heroin addicts. What made him stand out, was that he wrote about it and his novel, "Blueschild Baby", was published by a major publishing house, McGraw-Hill, in 1970. It is a major accomplishment for any writer to have their first novel published by a major publishing house. Yet George's accomplishment would be soon buried under the debris of a lost opportunity. Still, when I choose to remember George Cain, I prefer to recall his loving support for my musical creativity and hopes for my career as a recording artist. from the "big brothers" in the neighborhood. Sometimes, their influence is of greater importance than those of real family. When I was growing up, many a failed ghetto genius saw in me the potential to escape from inner city doom. Many a neighborhood heroin addict recognized my musical ability as a one-way ticket off the block. Those who had seen the dark side could clearly see the light in me. I never would have imagined that George would one day be that failed ghetto genius. One summer day, before George would join the ranks of the "should-have-beens", he would jump-start my musical career as a recording artist with one kind act. Oddly, this summer day would forever connect me to George Cain's first and only novel. I really cannot remember any of the details of that day as much as I can recall the outcome. What I do remember is that I encountered George on the street and he told me that he had just received his first royalty advance check from McGraw-Hill to complete his first novel. He was glowing, as happy as a young man could be. He told me to come with him, that he was going to take me someplace. I don't remember if we walked or how we got there but we soon arrived at Sam Goody's record store in midtown Manhattan. At the time, Sam Goody's was the most incredible warehouse for all of the world's music. It was to me like some giant exotic candy store. I would make pilgrimage to Sam Goody's just to look at the beautiful LP record covers. Unlike today's CD cases, these were big beautiful works of art that held the secrets to the musical universe. The most fascinating of all were the Jazz albums because the covers would be so cool. Blue Note covers were fascinating but all of the labels had fantastic artwork designs. I was young but I was already very knowledgeable, since my dad always brought home DownBeat magazine. I would always read the musician's blindfold test reviews and along with listening to WLIB, New York's premiere jazz station, I had many albums on my imaginary must buy list. Yet, the truth was, I was just a kid and I could not afford to buy any of these albums. Until that summer day when George Cain's largess and loving generosity changed my life forever. I can only remember how he made me feel. He told me to get whatever music I wanted to get and he would pay. I can recall being repressed by the social mores of my Caribbean upbringing. Though this was a grand gesture, I didn't want to be greedy or thoughtless. Though my mother wasn't there, I could hear her voice in my head. We were always raised with this sense of propriety and dignity that Caribbean parents impart to their children. So, I would mull my decision with great care since I had self-imposed limits that George never imposed. I don't remember all the albums I bought as much as I remember George urging me to let myself go and get what I truly wanted! I do remember that I reached for my biggest hero first; Miles Davis Quintet's "The Sorcerer" was my prize selection. Then I had to buy two John Coltrane albums; "Africa Brass" and "Expression". I think I bought McCoy Tyner's; "Expansions" that day and I know I bought the classic Sonny Rollins recording; "East Broadway Rundown". Max Roach's fascinating; "Drums Unlimited" was definitely on the list that day. I cannot remember just how many albums George bought for me that day but I do know that they were the start of my Jazz collection that now exceeds hundreds of recordings. His joy at receiving his first advance check included doing something special for me! Unfortunately for George, after his first novel was published and sold in book stores, he would get more royalty checks that financed his addiction to heroin. The money he received from McGraw-Hill for a second novel never provided it's intended outcome. There never would be a second George Cain novel. Today, George Cain's first novel; "Blueschild Baby" stands as the only testament to the life of a brilliant ghetto genius. 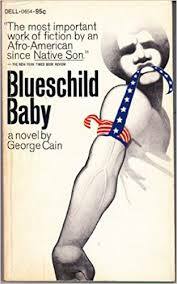 George Cain, a writer whose 1970 novel “Blueschild Baby” was greeted as an important exploration of the black urban experience in the United States but who abruptly disappeared from the literary scene as drugs took over his life, died on Saturday in Manhattan. He was 66. The cause was complications of dialysis he was receiving for kidney disease, his son, Malik, said. Written in a stream-of-consciousness style, in a poetic vernacular that draws heavily on street language, Mr. Cain’s autobiographical novel — the hero’s name is George Cain — describes a fevered journey through drug addiction and self-hatred to drug-free redemption. In the process, the hero comes to terms with his identity as a black man in the United States. In The New York Times Book Review, the scholar of black American literature Addison Gayle Jr. called it “the most important work of fiction by an Afro-American since ‘Native Son,’ ” and if other critics took a more measured view, most still regarded it as a promising first outing by a young writer with a compelling voice. There was no second novel. Instead, Mr. Cain struggled for the rest of his life with a dependence on drugs, primarily heroin, a future foreshadowed in his novel. “We stop at a stand selling all sort of African jewelry and I spot this necklace with a monkey’s head,” the narrator says. “Just like the monkey that haunts me. I buy it and throw it on. He hangs it round my neck and the hunger shall always be a threat.” George Maurice Hopkins was born in Manhattan on Oct. 27, 1943, and grew up in the Hell’s Kitchen neighborhood. His father, an employee with the Department of Labor, ascended the civil service ladder and reached the position of assistant regional manager, a job that allowed him to move the family to a middle-class neighborhood in Teaneck, N.J., soon after George graduated from high school. A precocious student, George went to public schools but after graduating from junior high school earned a scholarship to the McBurney School, a private academy run by the Y.M.C.A. of Greater New York. He attended Iona College in New Rochelle, N.Y., on a basketball scholarship but left in his junior year to travel to Texas, California and Mexico. In Mexico he spent six months in jail for marijuana possession. The narrator of “Blueschild Baby” attends a white prep school, where he takes drugs for the first time. After his beloved grandmother dies in a fire at the family’s apartment building, he experiences a crisis. On returning to the United States in 1966, he settled in Brooklyn and began writing “Blueschild Baby,” adopting the pen name Africa Cain. The surname reflected his fascination, as one of a pair of identical twins, with the biblical story of Cain and Abel. The first name, which he later dropped in favor of George, hinted at a continuing search for identity that led him, at various times, to make common cause with the Black Panthers and to convert, briefly, to Sunni Islam. Drugs dashed these hopes, and his life unraveled during the 1970s. His wife left, taking their children with her, and the marriage ended in divorce. He lost his job and lived a marginal existence in Brooklyn and, for many years, in Harlem. He produced no more literary work. In 1987, the Ecco Press reissued “Blueschild Baby” in paperback. In addition to his son, Malik, of Washington, Mr. Cain is survived by two daughters, Nataya Carter of Houston and Sabrina Giral of Manhattan; two brothers, Edmund and Keith, both of Manhattan; a sister, Arlann Walker of Teaneck, N.J.; and five grandchildren.